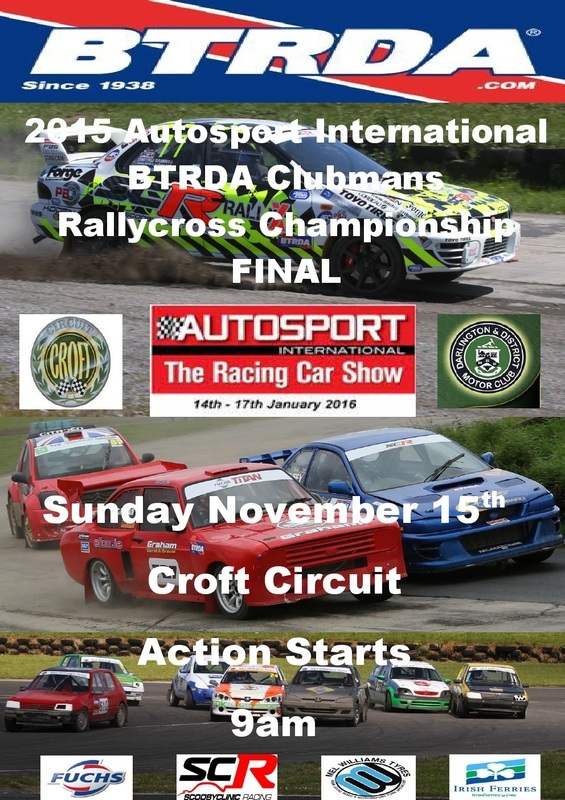 R7 FINAL November 15th Croft - "Rallycross: the best form of motorsport on 4 wheels"
Join us for a carvery and 2016 BTRDA Championship launch on Saturday evening, 14th November at the Jersey Farm Hotel, Barnard Castle. Mad Mark has set aside a private room near the restaurant and bar for all drivers, supporters, mechanices etc to get together. The large function suite is booked that evening so numbers are limited so early booking is advisable. All you have to do is either telephone the hotel 01833 638223 or email: mark@jerseyfarm.co.uk to reserve your places. Transport Mark has organised a bus to take you to Jersey Farm and back this will set off at 6.30pm on Saturday and return circa 11pm. Cost for this is £10.00 per person seats on the bus must be reserved prior so as to know what size coach etc to confirm. You can reserve seats up to the 5th of November and will be paid as on the coach in cash. If you have transporters or motorhomes and wish to park them at Jersey Farm over night and stay in them this is not a problem. We do hope you will join us and come in from the cold and make this a socialable night and come and find out all about the 2016 Championship.